The British Museum first opened in the 18th Century largely based on the collections of the scientist Sir Hans Sloane. The current neo-classical building was erected nearly a century later and is quadrangular with four wings and an imposing classical facade. 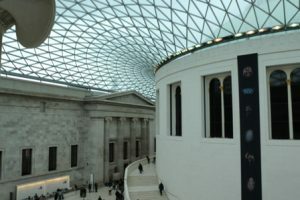 Inside is a courtyard, the Great Court, covered with a spectacular modern addition – a spiralling glass and steel roof which was designed by Norman Foster and completed in 2000. The courtyard surrounds the round Reading Room with a copper domed ceiling the same size as the dome of St Peter’s in Rome. The museum is Britain’s largest museum, one of the oldest in the world and widely considered to be one of the world’s greatest museums of human history and culture. The permanent collection comprises over 8 million objects spanning the history of the world’s cultures from the stone tools of early man to twentieth century prints. The collection includes controversial items including the Elgin Marbles from the Parthenon in Greece, Egyptian mummies and the Rosetta stone. The expansion of the museum over the years has resulted in the creation of several branch institutions including the Natural History Museum in South Kensington. The British Library previously occupied the Reading Room but in 1997 moved to a new site next to St Pancras Station on Euston Road. There are frequent special exhibitions of international significance.